A little essay on how mutations in Teenage Mutant Ninja Turtles work. Hi all, I'm new here and what better way to introduce myself then with an essay about the mutations in TMNT. First of all, I had this in mind for a while now and putting it all together was a lot of fun, so I hope you guys enjoy this. So what does mutagen do? It splices the DNA of the original host and combines it with the DNA of the last organism it has been in contact with. But the ratio with how it does isn't fifty-fifty, it's more 20% of the original and 80% of the guest DNA. The turtles themselves were touched by humans before they were mutated, either by Splinter or by an employee of the pet store where Splinter bought them. 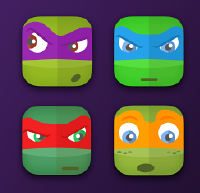 The turtles as infants in the 2012 series just after they mutated. So what traits of the turtles are human and what still is turtle? - Their back and front shells remain integral part of their skeletal structure, they can't step out of their shells. The 2012 series also shows the fact that as with actual turtles there's actually a side armor too, whereas on the 1987 design, the back and front shells look like armor plating covering only their chests and backs. - As with real turtles, the Turtles are amphibious, they are excellent swimmers and can hold their breath for a long time. - The Turtles still retain the ability to do THIS! - Well as the pictures of the turtles as infants already shows: their body proportions became that of a human, their arms and legs much longer in proportion to their torsos as they were when they were still regular turtles. This also accounts for how they are able to walk upright since a real turtle doesn't have the strength in its hind legs to support the weight of its body. - They have the ability to speak and understand human language, which means that their lungs and tongues are human, a real turtle makes noises by pushing air through their throats, they cannot make vowels to turn into words. - Their stomachs can digest human food, every pet store owner will tell you that you shouldn't feed turtles human food, since they can't stomach it. - They don't have scaly skins, you can see it in close ups of their faces in the cartoons and the comics, their skin is smooth as a human's. Which also happens to help out with their mouths becoming flexible so they can speak. - Although they retain their back and front shells, they are much more bendable, having the rigidity and flexibility of a human spine and chest casing, that accounts for how they can practice martial arts. - They have human eyes. - They can be attracted and fall in love with and, as was hinted in several panels in the comics, be sexually compatible with human girls. * Donatello and April O'Neil working side by side to disable Baxter Stockman's Mousers with the both of them sweating bullets. Which means that the Turtles are warm blooded, which also explains how Splinter could keep them underground without them dying. Real turtles because of them being reptiles have to warm up in the sun if they want to become active, which is also why if you buy pet turtles at a store, you have to have a lamp in their enclosure so they can warm up. SHE however is a different story. 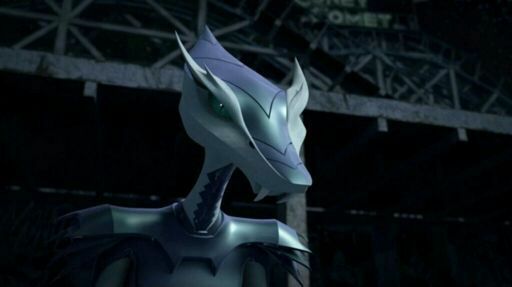 When Karai got mutated with the DNA of a horned viper, she became 80% Snake. As such the ratio of what is human and what is snake is different from what is human and what is turtle with the turtles. - She does retain her torso and hip structure which still makes her look feminine. Heck she retains her breasts but as a reptile, they aren't of much use. - Likewise, she also retains the shoulders and arms but her hands change into snake heads. - She can still speak somewhat and she can still recognize the ones close to her. - She becomes very feral, moves on instinct alone, which makes her very dangerous and unpredictable. - She becomes a stellar swimmer, able to remain submerged for a long time. - The fact that she has to go overground and warm up in the sun reveals that she's coldblooded. - She DOES get scaly skin, even when she goes into her "in-between" state, the scales all over her face become visible. - Likewise she sheds her skin, an ability which she uses later in the series to heal pretty significant injuries to her face. Hey, I know I have too much time on my hands. Last edited by The Great Saiyaman; 11-04-2018 at 12:53 PM. DAYUM you came in with guns firing, my man! Welcome aboard! Very interesting. I love reading posts like this. I wonder how characters like Scumbug and Fishface work, due to having even less in common with a human. Or perhaps on how the likes of SpiderBytez became very monstrous when mutated when others are still humanoid. a haphazard idea could be...it depends on how much mutagen you are exposed to? And also perhaps how long? Really no way to prove this, all I know is with Karai being the prime example, mutagen can be tailor made with specific specifications on how it will mutate someone. Though just as a visual preference, Xever would have turned into a "fish man" like a Zora from Legend of Zelda or the "deep ones" from cthulhu myth. Basically he'd have had legs. But then they would have needed another narrative way to introduce the Krang technology to Shredder...so...eh. Would I seem like a broken record if I said all this can be avoided if you stick to just mutating animals into humanoids? 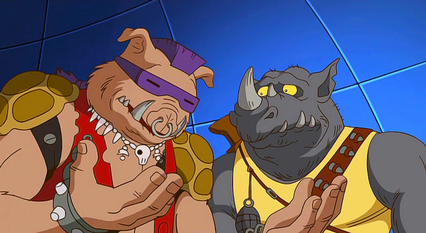 I mean really, who would complain if Bebop and Rocksteady started out as zoo animals? Aside from Cubed before he sees it in action I mean. If Bebop and Rocksteady became stupid by mutation, why didnt that happen to Hamato Yoshi when becoming Splinter? Because they were already dumb. 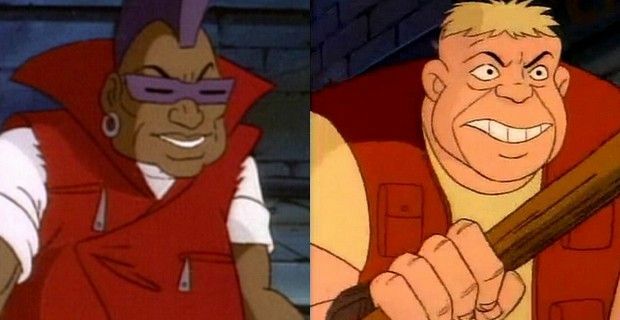 It depends on which version of Bebop and Rocksteady you're talking about, the 1987 version were two dunderheads from the get-go. Same story with Pre-mutation Bebop and Rocksteady in the IDW series. They too were able to get lost in a telephone box. Whereas Anton Zeck and Ivan Steranko, although far from being geniuses, are perfectly capable to be left on their own devices. - Zeck is a thief who uses high tech to render himself invisible and uses lasers to ride on and to throw from his mohawk, there is a lot of intelligence involved with that. - Steranko is a corrupt arms dealer, again something that requires brain capacity to do. After their mutations, they keep their intelligence and as conversations about weapons shipments with the Foot high command reveal, Steranko is still pretty much involved in his trade. Same with Fishface and Dogpound/Rahzar, their connections with the corrupt gangs of NYC are still pretty much valid after their mutations. I think IDW's approach makes the most sense; initially being a 2003/movie/Mirage mutagen applied to animal targets, but application to human targets is possible through injecting animal genes, for which the human body will serve as a focus for the genes as they course through the body. I also like how the mutagen has multiple components to ensure a successful mutation, which is why Pete has a low intellect, due to the impurities Hob introduced. I also like the reincarnation aspect added. It even makes the less conventional ones work; Wyrm is an aggregate of several worms, Mutagen Man is made from many species, and Ravenwood appears to be a different deal entirely. 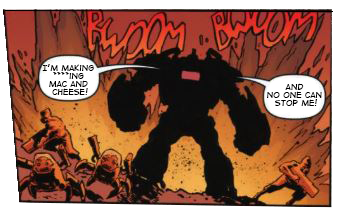 What I also loved with how IDW did it was not to sugarcoat how painful the process is, to use Hob's words "It's like being thrown into a sausage maker, you end up something totally different from what you were before." In my "Karai Versus Karai" fancomic, I had Donatello explain all the logistics involved when Karai changes into her snake form. There's simply no way a mutation feels pleasant. However by season 2 Baxter had been experimenting on the mutagen and was modifying it. 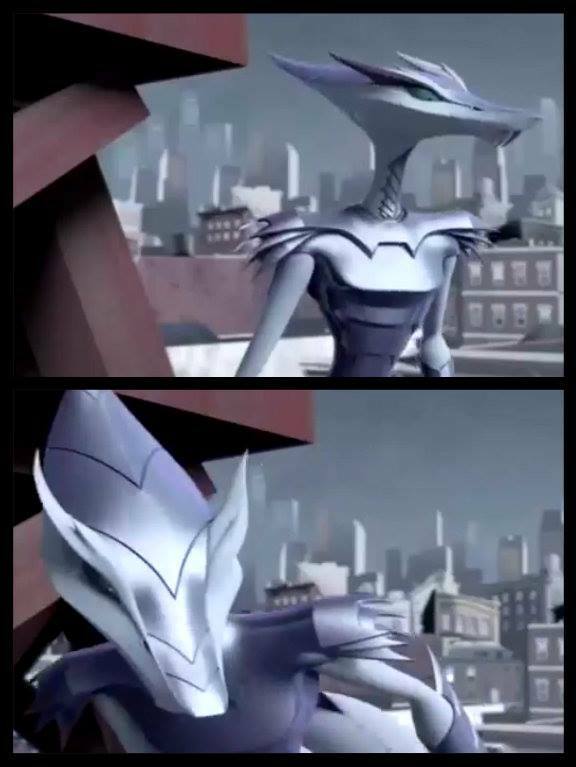 This results notably in Karai's mutation, but is later refined with Bebop and Rocksteady. Earlier experimental mutagen from the Foot clan in late season 1 and early 2 results in stranger abberations of the 'rules' such as Rahzars apparent undead form, and Timothy's amoeba like mutation. Don's attempt to refine mutagen into a healing fluid results in REALLY weird stuff like Dr Cluckenstein, Creep and particularly Speed demon. The latter of which really stretches the understanding of what mutagen should be capable of. In fact the most successful mutants (in terms of their stability and best balance of animal and host traits) are really those who were exposed to the baseline pure mutagen by the Kraang - including Tigerclaw, Alopex and Leatherhead. Arguably the most successful of all of these is of course April - though she is particularly interesting because shes the only one where I got the impression there was a deliberate attempt to create her through a genetic bloodline (so controlled breeding of her ancestors leading finally to result in her birth). Which would explain her uniquely human appearance compared to other mutants.